An ankle injury can range from being mildly uncomfortable to excruciatingly painful. When it’s minor, your ankle injury treatment often consists of rest, ice, compression and elevation, as prescribed by your NYC sports injury doctor. Swollen ankle injury treatment may consist of surgery if you have a torn ligament or broken bone. No matter what you need, you’ll get the best treatment for ankle injury advice from your physician at the Sports and Pain Institute of NY. Come to our sports pain management clinic to get your pain evaluation and treatment. 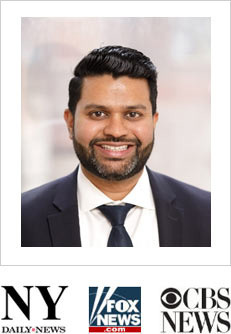 Meet our pain doctor Febin Melepura M.D. to get the pain relief you need in the safe, reassuring hands of the best pain management specialists in NYC. Your ankle joints are composed of the weight-bearing leg bone (the tibia), the stabilizing leg bone (the fibula) and the ankle bone (the talus). Your ankle forms the intersection of all three bones. 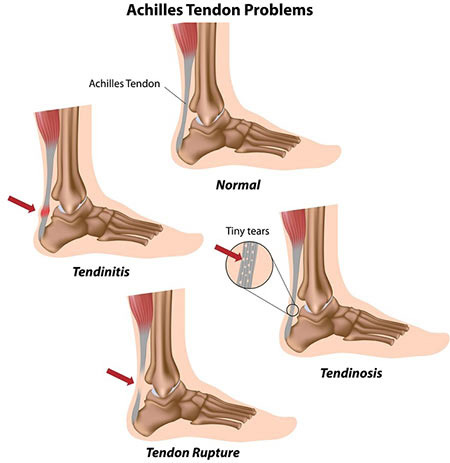 Tendons and muscles work together to allow you to move your ankles so you can walk and remain mobile. The ligaments hold the bones together. Fractures and ankle sprains are the most common sources of ankle pain and injury. And while athletes, especially runners, are more prone to foot pain and ankle injuries, anyone can easily stumble and end up with an ankle injury. And when it happens, your Midtown Manhattan sports medicine doctor is ready to provide you with the best treatment for ankle injury in NYC. A sprain occurs when you somehow damage a ligament. Swelling, difficulty walking, pain and tenderness are the most common symptoms of sprains. The second most common cause of ankle sprains and stress fractures is walking on uneven ground, causing you to turn your ankle. Remain off your foot until the swelling subsides. And that means refraining from participating in the activity that led to the sprain in the first place. Cold compresses help reduce inflammation. Apply ice as soon as possible after you hurt your ankle and continue this treatment off and on, for about 20 minutes at a time, for about 48 hours. A snug elastic bandage also helps reduce swelling and eases the discomfort. Keep the swelling down by elevating the affected foot on a couple pillows. Ideally, keep your foot higher than your heart for maximum benefit. If, after the first 48 hours of homecare, you still have swelling — and especially if you begin to see more bruising — go back to your Midtown sports medicine doctor for further testing and swollen ankle injury treatment. Your doctor relies on imaging tests like x-rays, ultrasound and MRI to evaluate the damage and develop the best treatment for ankle injury to suit your needs. If you’ve broken bones in your ankle, you may need surgery and the insertion of screws and pins to hold it back together. Smaller stress fractures usually heal with time and rest. Immobilization with a boot, with or without crutches, usually is recommended during swollen ankle injury treatment for fractures. Torn ligaments must be treated with surgery to repair them, while tendonitis often responds better to injections to decrease pain and inflammation. Recovery from surgery can take up to eight to 10 weeks, while sprains may resolve in as little as two weeks, when you follow your doctor’s orders. Your Manhattan sports medicine doctor is well-versed in pain management for the best type of pain reliever to use. Whether you need over-the-counter pain relievers or prescription-strength drugs depends on your level of pain and the severity of your ankle injury. Warming up sufficiently before each activity by stretching your soft tissues makes your muscles more flexible and easier to go with the flow of the stresses that you place on them. Wearing appropriate shoes for each activity helps to ensure you maintain your footing. For example, you shouldn’t be surprised when you turn your ankle while hiking in wedges. Staying away from trails and paths that are notoriously uneven. Be especially mindful of your step when you do decide to tackle difficult terrains. Paying attention at all times when you’re playing your sport, working out or just walking can help you avoid many pitfalls. Texting while walking is one of the latest popular reasons that people need to visit a New York sports medicine doctor for ankle injury treatment. Changing out your running shoes every 300 to 400 miles, as recommended by trainers and sports medicine doctors in Manhattan keeps your feet fresh and your ankles safe. Do you have any questions about the ankle injury treatment we offer in NYC? Would you like to schedule an appointment with the best rated ankle doctor Febin Melepura MD of sports pain management clinic in New York? Please contact our office for consultation with the pain relief specialist in Midtown Manhattan.